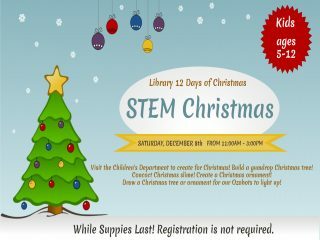 Kids ages 5-12 are invited December 8th from 11:00am-3:00pm to visit the Central Library Children’s Department to create for Christmas! Build a gumdrop Christmas tree! Concoct Christmas slime! Create a Christmas ornament! Draw a Christmas tree or ornament for our Ozobots to light up!